The Agilent 70903A provides narrow resolution bandwidths, from 100 kHz to 3 MHz and can be used in any of the configured systems. This intermediate frequency (IF) section provides signal processing elements required for spectrum analyzers and lightwave signal analyzers. The Agilent 70903A maximizes measurement speed using 10% incremental bandwidths. Wider bandwidths offer the most speed, whereas narrow bandwidths offer more resolution and sensitivity. The 10% incremental bandwidth steps offer you the best choice of bandwidth sizes. The bandwidths can also be changed in a 1, 3, 10 sequence. 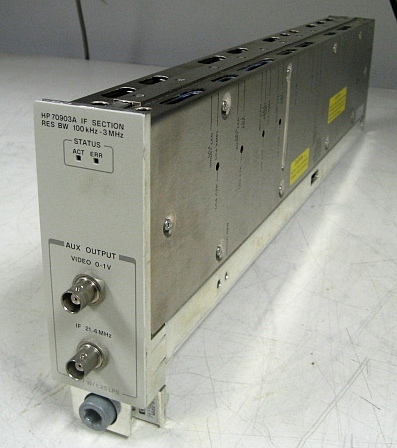 Calibrated logging amplifiers provide superb amplitude accuracy for the analyzers. 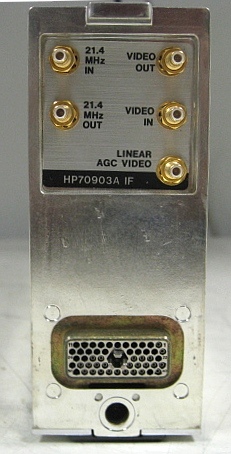 The 21.4 MHz IF output on the Agilent 70903A allows connection to other instruments such as demodulators, digitizers, and oscilloscopes.